This CD is a lovely and safe way to introduce 4-7 year olds to the world of relaxation and to help them find their inner calm. Don’t be surprised if they return feeling very special and twinkly! 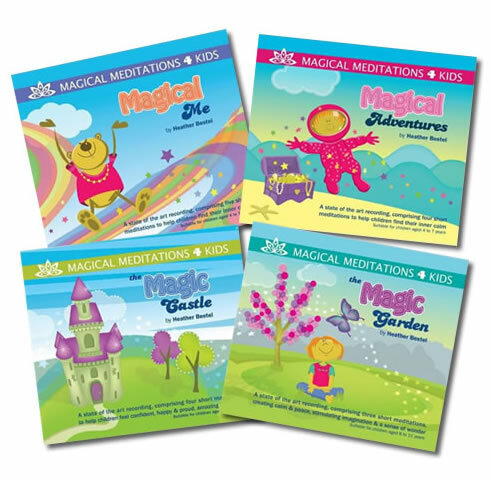 With the use of these CDs, Children learn to find their inner calm and develop some wonderful resources to empower them whenever they need. This CD is a lovely and safe way for our 4-7 year old magical explorers to discover their inner resources as they venture. Helping them along the way to build their confidence and creativity. This CD is a lovely and safe way for 8-11 year old children to feel calm & confident, increasing feelings of happiness and pride and helping to build a belief in being amazing and talented. This CD is a lovely and safe way for 8-11 year old children. They will love visiting their own special quiet place where they can develop a sense of wonder and feel: calm and peaceful, happy and relaxed, safe and loved.